Congratulations to the Winter 2017 Day College Students of the Semester! Shawn Cobb (left in photo) is enrolled in the BBA in Accounting program with a 4.0 GPA., earning President’s List recognition. 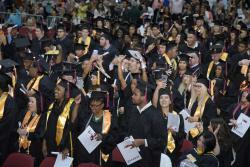 The College of Westchester celebrated its 101st Commencement Ceremony at Westchester County Center on Thursday, June 1st.